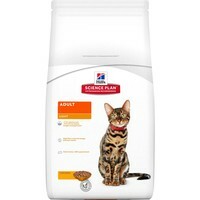 Hills Science Plan Light Dry Food for Adult Cats is a nutritionally complete diet that has been designed for cats that are less active, neutered or otherwise prone to excess weight gain. Made with a high lean protein and fibre content to make your cat feel fuller for longer, this delicious meal will still provide your cat with all the nutrition they require to live a happy and healthy lifestyle. Continued use of Hills Science Plan Light, combined with the right amount of exercise, will help your cat to regain and maintain their ideal weight.